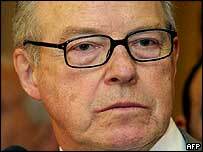 Former UN chief weapons inspector Hans Blix has said Britain and the US dramatised intelligence information to bolster the argument for the Iraq war. He told the BBC those who drafted the UK's Iraqi arms dossier acted like salesmen trying to "exaggerate the importance" of their wares. He told Breakfast with Frost he did not think Tony Blair acted in "bad faith". But he said citizens in the West expected "a bit more sincerity" from their leaders and politicians. Both the US and UK governments have announced inquiries into the accuracy of intelligence reports. Mr Blix said British and American intelligence officials had placed too much weight on what Iraqi defectors told them. He also blamed "spin" which both governments put on the intelligence for the mistake. "It was to do with information management. The intention was to dramatise it," he said. He challenged the UK and US to produce the evidence of weapons programmes they claim to have uncovered. He added: "Is there clear evidence that there were programmes? Maybe so, I don't deny the possibility." 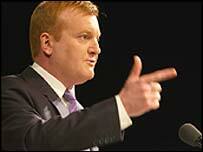 Liberal Democrat leader Charles Kennedy told the programme the prime minister must make a formal statement setting out what he and his ministers knew about Iraq's weapons. Tony Blair said last week he did not know the so-called "45-minute claim" only referred to Iraq's battlefield weapons. But Mr Kennedy said the "mess of contradiction" from the government must be clarified. He said: "The important thing now is that we do resolve the political judgement at the time... We were able to do that with the Falklands conflict, why can't we do it with Iraq?" But Mr Kennedy said Tory calls for Tony Blair to resign over the issue were a "distraction". Former foreign secretary Robin Cook told the BBC Tony Blair's intelligence advisors should step down if it was shown that the prime minister was not told about the nature of the Iraqi missile threat. Mr Cook said the Joint Intelligence Committee had a duty to explain fully the situation in assessments it sent to Downing Street. Meanwhile, a former intelligence chief has said the Iraqi arms dossier should have been written "exclusively" by experts without any interference from Downing Street. Sir Paul Lever, former chairman of the Joint Intelligence Committee, said the publication was "sloppy" in places, adding that things would have been done differently if he had been in charge. "I personally would have preferred to have the JIC present something drafted exclusively by the JIC in the format which the JIC itself chose," he told Sky's Sunday with Adam Boulton. Sir Paul said the claim that weapons could be deployed within 45 minutes had been "over-emphasised" in the UK dossier on Iraq's weapons. But Lords leader Baroness Amos has argued against calls for a confidence vote in the prime minister, insisting it was not necessary for him to go before the House. She also rejected claims that the government "dramatised" intelligence on Iraq, saying Lord Hutton's report had cleared the government on the issue. It has also emerged that Tony Blair has offered to meet the widow of Iraq arms expert Dr David Kelly. But Janice Kelly, 58, has not yet responded to his overture, according the Sunday Telegraph. The Kelly family blames the government for outing him as a BBC source. "The questions are not going away for the UK government"